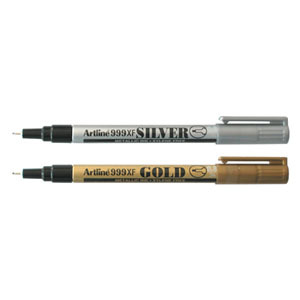 The Artline 999 Extra Fine Point Marker is an opaque permanent marker with rapidly drying pigment ink that once dry, will not fade. This marker is ideal for all types of practical permanent marking such as labelling or measuring, as well as a variety of decorative applications. The Artline 999 Extra Fine Point Marker is suitable for any surface including black material, and may be used indoors or outdoors. The metallic ink in the markers is made with pigments with reflective qualities, and gives a slightly embossed finish when dry. 0.8mm line width.